In 1972, the Social Security Act was amended to authorize funding for the treatment of end-stage renal disease under Medicare. At that time about 40 patients per million population were receiving longterm haemodialysis treatment and 40% of dialysis treatments were home-based (Relman, 1980). Now, a decade later, patients on dialysis treatment in the United States exceed 250 per million population. 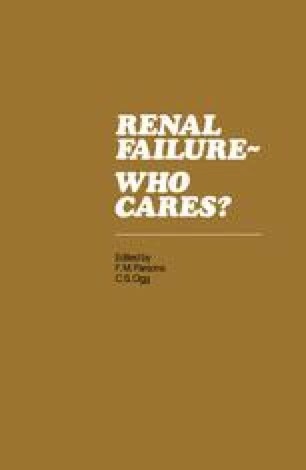 Less than 15% are dialysed at home (End-stage Renal Disease, 1980; Quarterly Statistical Summary,1981; The Kidney Dialysis Industry, 1981).